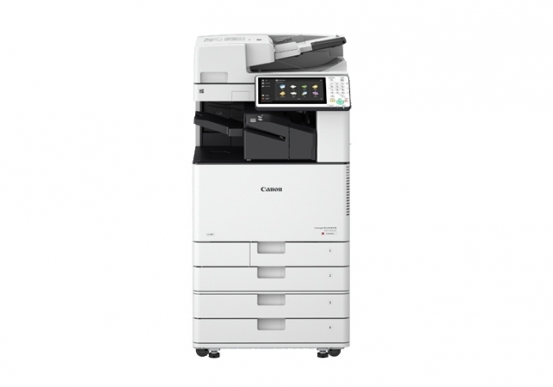 Canon\u2019s imageRUNNER ADVANCE C7565i device is designed to deliver outstanding image quality and gives high-volume workplace environments a multifunction printer, scanner and copier capable of producing high-quality content for diverse needs. Designed to help improve workflow, this Canon all-in-one printer can integrate with intuitive software and services, providing a high-speed, dependable color solution for demanding multi-user environments, from libraries to marketing departments, university copy shops to walk-up printing stations. With an updated, modern design, the imageRUNNER ADVANCE C7500 line of Canon printers can give workforces or self-service users an easy-to-operate device. The imageRUNNER ADVANCE C7565i is designed to complement every stage of the document lifecycle \u2013 from creation to management, output to archival \u2013 while aiming to support customers\u2019 security and environmental goals. Packed with features, like an intuitive user interface and built on the third generation imageRUNNER ADVANCE platform, the imageRUNNER ADVANCE C7565i model produces an output of up to 65/60 ppm in both black and white and color, and the capability to scan up to 240/220 ipm (black and white/color, 300 dpi) for a wide range of media and paper sizes. Color (C,M,Y): 66,500 Copies / Bottle FOOTNOTES1 Time from device power-on to when copy jobs can be programmed. 2 Includes main unit, ADF, and consumables. 4 EPS can be printed directly only from the Remote User Interface. 5 Requires the optional PCL International Font Set-A1. 6 Requires the optional Barcode Printer Kit-D1. 8 0.9 W Sleep mode is not available in all circumstances due to certain settings. 9 For current EPEAT rating (Gold/Silver/Bronze), please visit www.epeat.net.